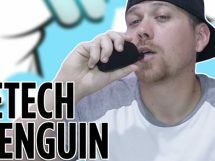 In this Joyetech Ocular C Review, I go in-depth by telling you about the Ocular C, a close up view unboxing it, and I show you how it performs. In all honesty, the Joyetech Ocular C is an amazing mod that offers plenty of features, ensuring that you’re getting a good value for the device you pay for. 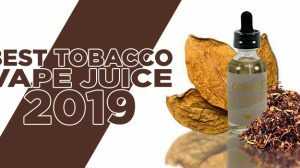 However, I personally feel that this device would be even better if Joyetech focused more on features vapers need and would benefit more from, rather than gimmicky features such as a pedometer. Imagine if the Ocular C was a device that has a color touch screen and an app to go along with it, but operated like a DNA and EScribe. The world would be a much better place. Appearance: The Joyetech Ocular C looks pretty much like any other device, when the large color touch screen isn’t illuminated. It features a stainless steel chassis, a single side fire button, and there isn’t much to it other than that. 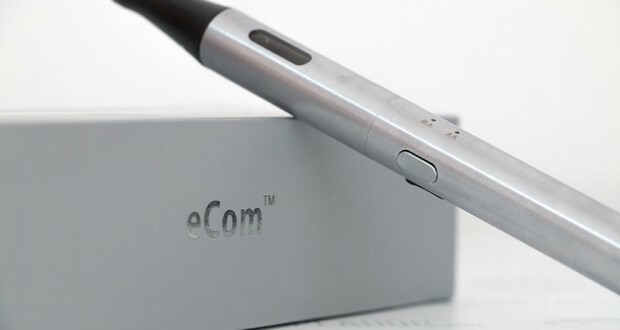 The big part of this device and the reason why Joyetech can get away with its lacking jazz in appearance is all due to the touch screen that makes quite the statement. Now, when the screen is lit up, the device transforms into this beautiful work of art. 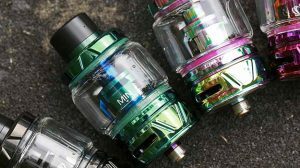 A boring stainless mod quickly turns into a colorful, vibrant, and detailed mod that quickly makes you forget about the lack in fancy designs like many of the mods coming out today. Features: As far as its features go, there are many to name off. 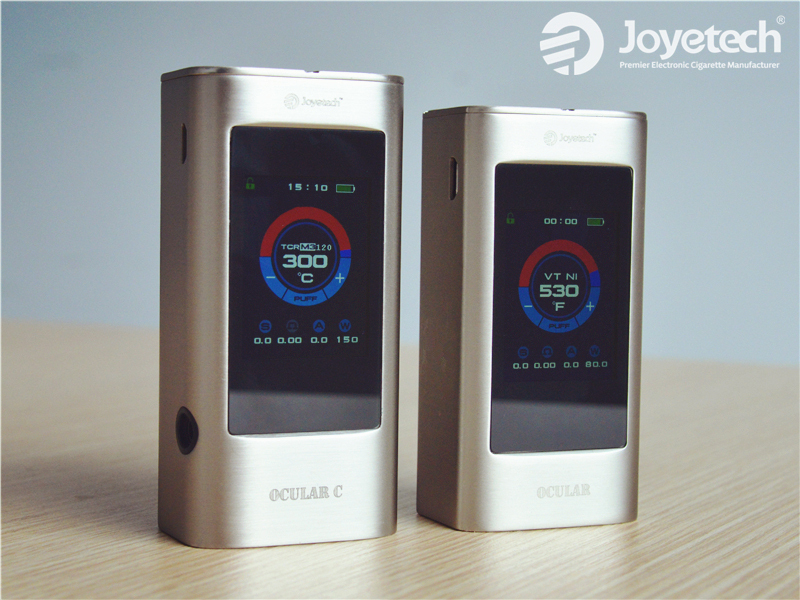 For starters, the Joyetech Ocular C Mod offers up to 150 watts of vaping power, it supports a resistance as low as 0.1Ω in wattage mode, but you can upgrade the Ocular C to 200 watts, if you’re hungry for more power. Along with a nice power offering, it also sports a full temperature control suite, supporting Ni200 Nickel, Titanium, 316 Stainless Steel, as well as TCR adjustments. While in its TC mode, you can range from 200 to 600 degrees Fahrenheit, and fire down as low as 0.05Ω. And the features do not stop there, it continues. Now, if you’re wanting an incredible screen to look at on your device, you can get it from this 1.68 inch color touch screen. It has a capacitive touch panel, meaning adjusting the wattage, changing modes, and navigation is all done by a simple touch on the screen, just like the smart phones we use today. Furthermore, you’ll get to take advantage of an MP3 player, photo storage, a pedometer to track steps, a puff counter, a screen saver, and it has a 2GB memory storage. Lastly, the bottom of the device has a locking hinge battery door where it covers a battery bay that holds two 18650 batteries. 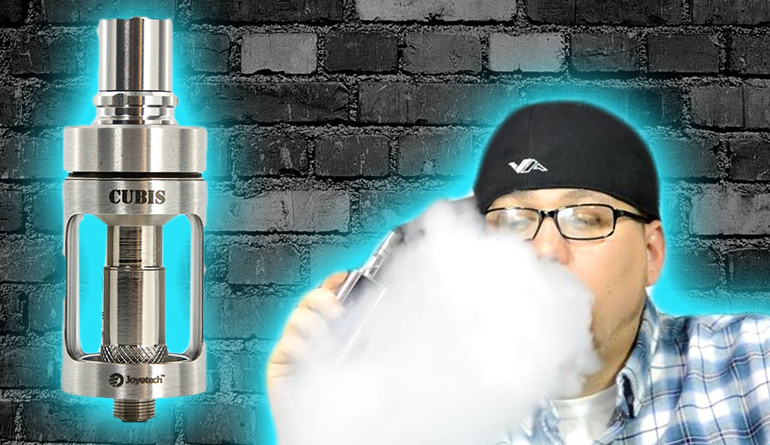 There are additional features like a stainless steel 510 connector with a gold plated spring loaded center pin, a micro-USB of course, and plenty of safety features. My issue here is that all of these features are great, but not needed. There was a recent study recognizing that vapers prefer convenience with their device’s, and though touching a screen may seem like operating the device is easier, there’s just too much going on, and too much that wouldn’t be used. 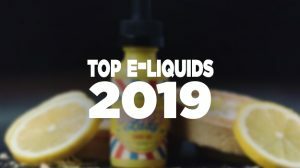 Joyetech really should have focused on vapers more specifically, rather than everyday people. 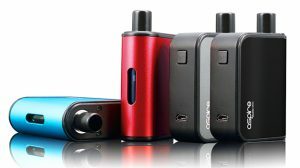 If we want to listen to an MP3 player, look at photos, or track steps, we’ll use our phone, not our vape mod. 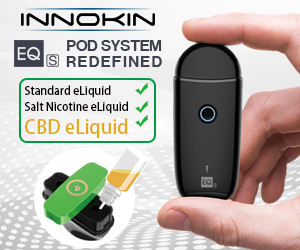 When we ask for features in a mod, we want things that will improve our actual vape experience, such as output options, fine-tuned vape controls, and other features like what the DNA chipset offers. Though the Joyetech Ocular C is a great device, it’s also a gimmicky one. Performance: With the ability to reach up to 150 watts, and ability of upgrading to 200 watts, along with a full temperature control suite, and Joyetech’s known performance offerings that’s recognized throughout all its mods, you can expect a true quality vaping experience when using the Joyetech Ocular C Mod. 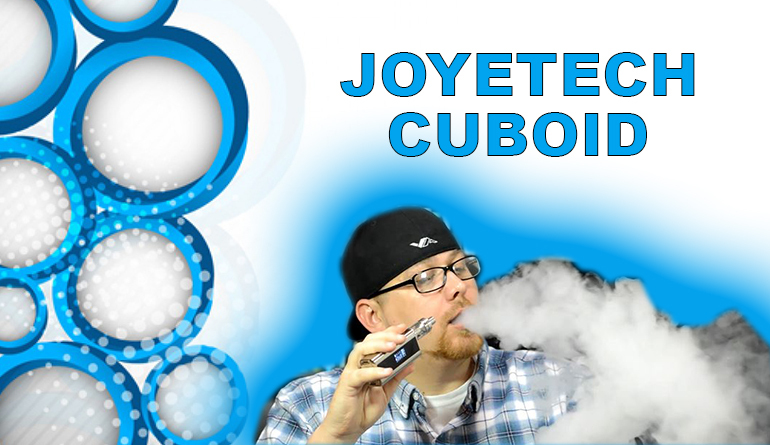 Joyetech isn’t new to the game by no means, so you can expect consistent hits, plenty of power, and all of the features equipped on this device will work as they should simply due to the manufacturing brand behind it.